The Fourteenth Judicial District Commission on Judicial Performance UNANIMOUSLY recommends by a vote of 10-0 that Judge Mary C. Hoak BE RETAINED. Background: Mary C. Hoak received her Juris Doctorate from the University of Chicago Law School in 1992. She was appointed judge to the Grand County Court in 2002, and was appointed to the District Court bench in July 2007. 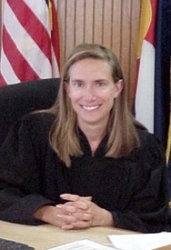 Prior to her appointment in 2002, Judge Hoak practiced law in Grand County for nine years with focus on criminal prosecution, criminal defense, social services work, family and juvenile law. In the community, Judge Hoak has volunteered as a Reading Buddy at a local elementary school, organizes Law Day annually for all fifth graders in Grand County and has been a mentor for young lawyers in Colorado. Evaluation: The Commission reviewed written evaluations of Judge Hoak, which included verbatim comments, from attorneys and non-attorneys. The non-attorney responses were from jurors, law enforcement, social services, courthouse personnel and non-attorney litigants who have appeared in front of the judge. The Commission also considered letters to the Commission concerning Judge Hoak, a self-evaluation by Judge Hoak, written and oral comments of the Office of the District Attorney, and orders and opinions written by Judge Hoak. Members of the Commission personally observed Judge Hoak in her courtroom and conducted a face-to-face interview of her. Of attorneys responding to the written survey, 81% recommended to retain, 14% not to retain, and 5% expressed no opinion. Of all non-attorneys surveyed, 93% recommended to retain, 4% not to retain, and 4% expressed no opinion. Performance: Survey results show consistently high marks for Judge Hoak across all performance criteria. Judge Hoak rates highest among attorneys for her diligence in the courtroom and highest among non-attorneys in communication. During Judge Hoak’s evaluation it was clear that she provides thorough explanations when addressing parties in the courtroom as well as in her written orders. Many respondents commented on Judge Hoak’s hardworking nature, timeliness of cases, and commitment to being impartial in her rulings. Some responses noted that Judge Hoak can become overly familiar when off the record. Other comments of helpful criticism were that Judge Hoak speaks too quickly, and could be more deliberative in her decision-making. During Judge Hoak’s interview she stated that she appreciates the challenges of the job, always strives to improve her performance, any mistakes she’s made she tries to fix immediately, and she continually tries to be the best judge she can be. Judge Hoak’s high retention recommendations demonstrate that Judge Hoak is a well-regarded and effective judge and that she continues to improve her performance.